The selling environment and role of the sales professional have changed. Gone are the days when the organisation, the product, or the solutions provided the greatest opportunity for differentiation. Today is no longer about features and benefits, need-satisfaction, or solution selling; it’s about the role that the sales professional plays as the single biggest point of differentiation. 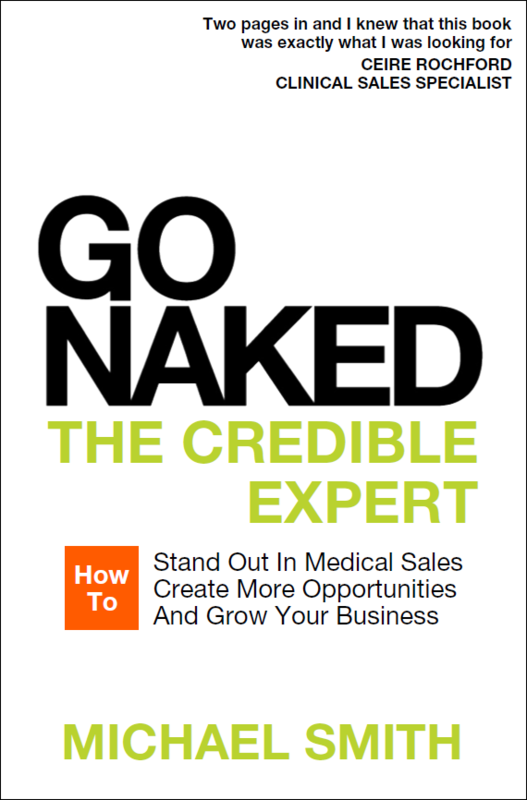 The Credible Expert provides you, the sales professional, with the second installment of the GO NAKED series, this time with an even more thought-provoking and practical perspective on how to stand out, create more opportunities, and grow your business in the world of medical sales. It breaks down the steps required for securing opportunities and making sales so that – irrespective of your experience – you will be able to select the right customers, deliver compelling messages, learn how to create personal value and significance, and develop thought-provoking and change-enabling discussions. Everything is geared towards one thing: making you the most successful salesperson possible. Based on the inherent belief that it’s the salesperson that makes the biggest difference in delivering successful outcomes, this book will provide you with a step-by-step guide to becoming the Credible Expert in your market. By following its medical sales methodology, you will stand out, create more opportunities, and deliver business success. Michael Smith is co-founder of Developed Edge, a training and development organisation that works specifically with medical companies to help them identify the best way to sell to their customers and then create customised and competency based training programmes. He has previously served in numerous international sales and marketing roles, most recently as Director of Sales for Europe. He is a best-selling author and also works as a Coach, Speaker, and Advisor. Note: This is the sister book to 10.4 Interactions: How to Develop a Sales Touch System, Guide the Customer Conversation, and Sell with Credibility in B2B Sales. Content elements across both titles are related and readers are, therefore, advised not to purchase Go Naked if they already own 10.4 Interactions.